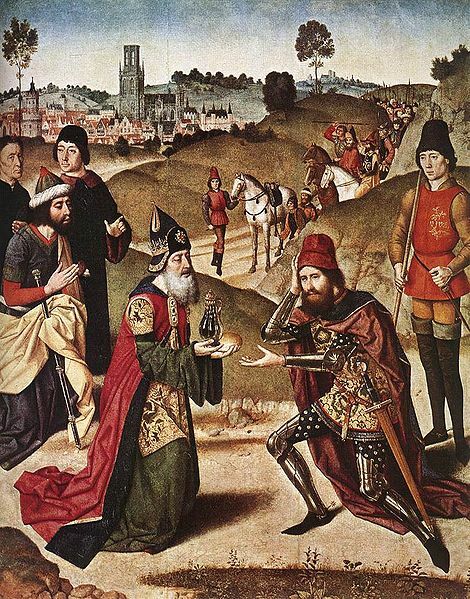 Occult tradition states that the mysterious figure Melchizedek, who is mentioned in the Bible in connection with giving communion to the patriarch Abraham, is an entity that brought three gifts to earth from the planet Venus: the bee, wheat, and the mineral asbestos. The tradition is an allegorical one. The meaning of the three gifts may be partially understood as symbolizing three grades of initiation. In the first grade, one serves (bee). In the second grade, the initiate focuses on understanding and practicing the development of the many out of the one (wheat). In the third grade, the initiate becomes a channel of the Divine Fire; he burns, but is not consumed (asbestos). Wow….Painting of Abraham and melchizadek looks gr8. Nice blog “Melchizedek’s Three Gifts from Venus” Enjoyed it very much.